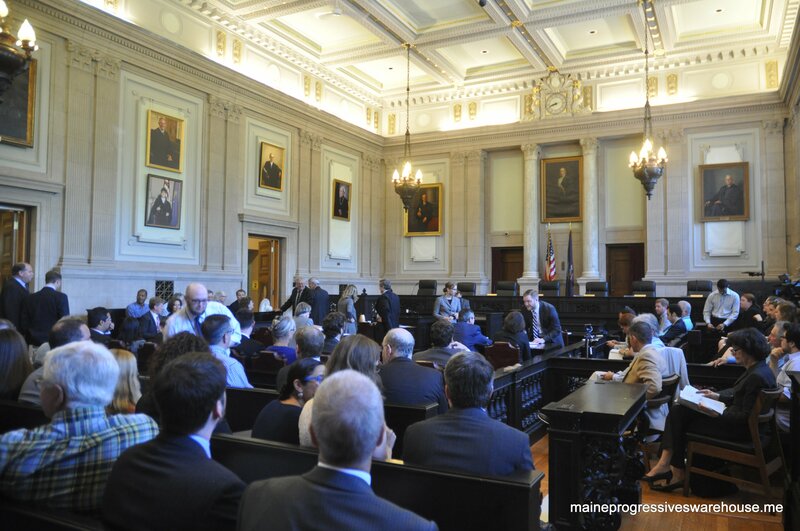 On the first day of the 2016 session, the Maine House Democratic caucus took time before the start of the day’s work to lay out their objectives for the remainder of the 127th session. 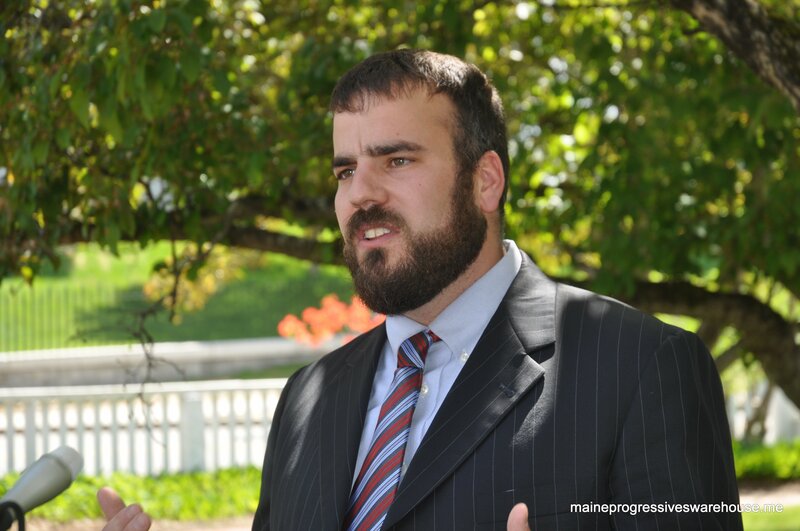 House Majority Leader Jeff McCabe and Assistant Majority Leader Sara Gideon focused on job creation and the economy, particularly for rural Maine. House Democratic leadership take questions from Maine press, 1/6/16. McCabe, D-Skowhegan, noted that the release of voter-approved Land for Maine’s Future bonds, growth of the agricultural sector, and promotion of the outdoor recreation economy are all key. Gideon, D-Freeport, focused on how investments in broadband and renewable energy can boost the economy. The accompanying press release is below. As anticipated, the Maine Supreme Judicial Court wasted no time in coming back with a speedy response to last week’s hour long hearing, issuing the following opinion today: a 6-0 smack-down of Governor LePage (PDF). 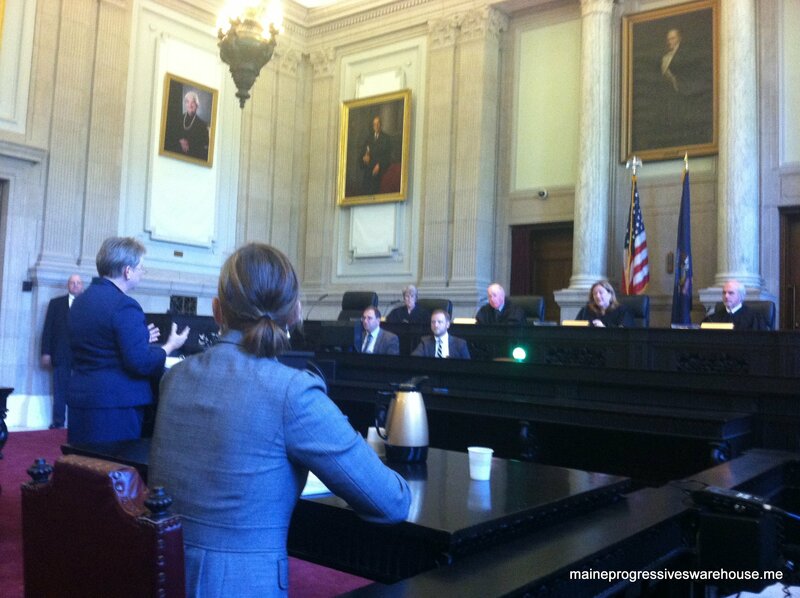 Governor LePage’s legal council Cynthia Montgomery delivers her argument to the Maine Supreme Judicial Court, 7/31/15. “Today, Maine’s highest court confirmed that the Governor’s inaction on these 65 bills resulted in them becoming law. While I am disappointed that some of these measures are now law, I am pleased that we have a court opinion which reaffirms the longstanding, 195-year old practice of dealing with vetoes that is outlined in the Constitution. 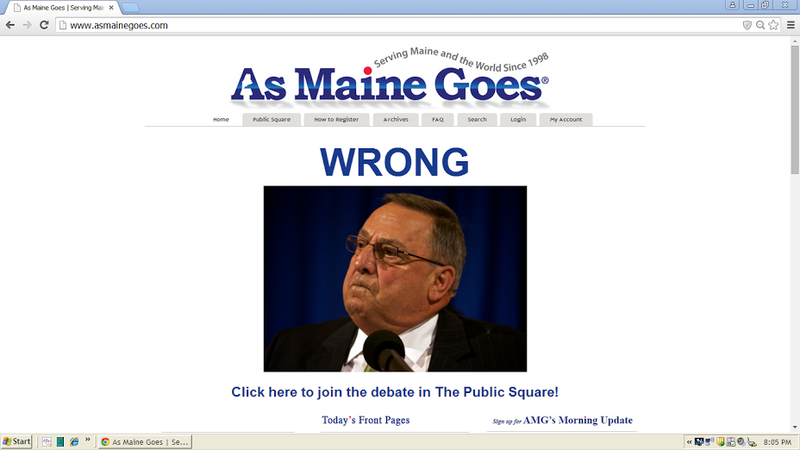 Front page of Maine Republican site “As Maine Goes”, 8/6/15. “Today’s court opinion reaffirmed what virtually every observer knew from the very beginning – that the Governor’s interpretation of the Constitution was incorrect. As he has stated, the Governor’s aim with these vetoes was to waste the Legislature’s time. What form of adjournment prevents the return of a bill to the Legislature as contemplated by the use of the word, adjournment, in Art. IV, pt. 3, §2 of the Maine Constitution? constitutional three-day procedure for the exercise of the Governor’s veto? Are the 65 bills I returned to the Legislature on July 16 properly before that body for reconsideration? The Court announced that they would hear the arguments within 2 weeks of the governor’s request. They also posted all documents submitted. Letter from Governor Paul R. LePage to the Justices of the Maine Supreme Judicial Court, dated and filed July 17, 2015, containing request for an Opinion of the Justices (with Exhibits 1-8). Procedural Order dated July 20, 2015 at 4:00 p.m.
Disclosure, Maine Code of Judicial Conduct, Canon 3(E)(3), dated July 20, 2015 at 4:00 p.m. The Justices will hold Oral Argument on the Governor’s Request for an Opinion of the Justices at 9:00 a.m. on Friday, July 31, 2015, in Courtroom 12 of the Cumberland County Courthouse in Portland. 1. Counsel for the Governor (Cynthia Montgomery) will be allotted fifteen minutes for argument. Up to three uninterrupted minutes may be reserved; up to two minutes may be reserved for rebuttal. 2. Counsel for Representatives Kenneth W. Fredette, Eleanor M. Espling, and Jeffrey L. Timberlake (Clinton Boothby) will then be allotted up to five minutes for argument. No uninterrupted or rebuttal time is allotted. 3. Counsel for the President of the Maine Senate and the Speaker of the Maine House of Representatives (Timothy Woodcock) will then be allotted up to fifteen minutes for argument. Up to three uninterrupted minutes may be reserved, but no rebuttal time is allotted. 4. Counsel for the Attorney General (Rosemary Gardiner) will then be allotted up to five minutes for argument. No uninterrupted or rebuttal time is allotted. 5. Counsel for the Governor will then argue in rebuttal if time has been reserved. Here is the full press pool video. Photos from within the courtroom here. Afterwards, Rep. Jeff Timberlake (R-Turner), Rep. Heather Sirocki (R-Scarborough) and former Secretary of State Senator Bill Diamond (D-Cumberland) met with press to discuss the just concluded Maine Supreme Judicial Court oral arguments heard regarding the 65 vetoes disputed by Maine Governor Paul LePage. Democratic House leadership released statements. No word as to when there will be a response from the justices, but it could be fairly quickly. The Legislature’s Government Oversight Committee this week launched an investigation into whether Governor Paul LePage misused state funds and abused his power to exact retribution on a political rival. It was a remarkable vote. The six Republicans and six Democrats on this watchdog panel were unanimous in their understanding that Maine people deserve answers and expect transparency from their governor. Good morning. 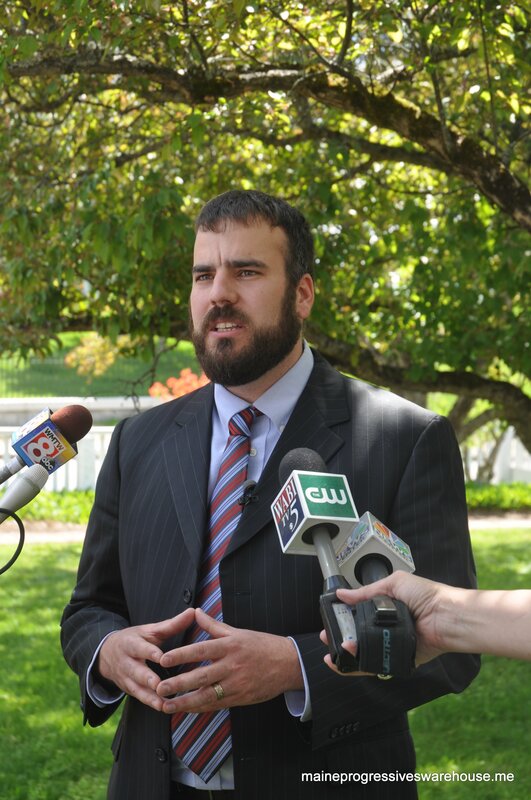 I’m Representative Jeff McCabe of Skowhegan, the House majority leader. Thank you for tuning in. The people of Maine need to know whether their governor did, in fact, threaten to withhold state funds from a historic private non-profit school that serves at-risk youths if they followed through with their plans to hire Speaker Mark Eves, forcing Good Will-Hinckley to rescind its employment offer. House Majority Leader Jeff McCabe speaks with press at the Blaine House, 5/29/15. This kind of political retribution is unacceptable. Every elected official in Maine must feel free to vote their conscience without fear of ending up on the governor’s enemies list. No Maine citizen should have to look over their shoulder, worried about being the target of the governor’s vendetta politics simply because they disagree with him. No Maine school, town organization or institution should have to worry about becoming collateral damage because of the governor’s agenda of retribution. The governor – just like any other public official – is accountable to the Maine people. That’s why I applaud the Government Oversight Committee’s unanimous bipartisan decision to authorize the investigation. That’s also why I’m concerned that the governor is trying to dodge serious questions about how he has conducted himself in office. Governor LePage is not above the law or exempt from the Constitution. Governor LePage promised transparency to the Maine people, but now he is trying to avoid questions about the misuse of public funds and other outrageous abuses of power that reek of Nixonian politics. I’m calling on Governor LePage to fully cooperate with this investigation. Let me be clear: this investigation is just one of the options on the table. If the governor wants to push us toward other avenues, we will go there. I speak as a representative of the Maine people. I also speak on behalf of the entire House Democratic caucus when I say we owe it to the people of Maine to do everything we can to restore their trust in our political system. The demand for an investigation has been intensifying – and for good reason. We are talking about some of the most cherished values we hold as Mainers and Americans. No Maine woman or man should have to fear losing their job because a powerful politician has put them on their enemies list. That’s not the government Mainers want or deserve. They want honest elected officials who are not only fighting every day to improve the lives of Maine people but also protecting our Constitution and the rights we hold dear. It’s our responsibility in the Legislature to stand together to preserve the integrity of our government and the offices we hold. Thank you for listening. I’m House Majority Leader Jeff McCabe of Skowhegan. I wish you and your families a safe and happy Fourth of July.